There are many strong athletes in various other sports. Sports such as Feild athletics(hammer throw, javelin, shot, etc. ), Rugby, and many others. I intent to include many of the athletes from those sports here as I think they deservse some props also. 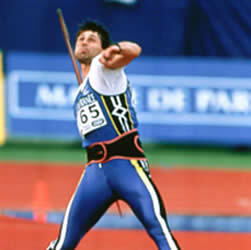 Jan Zelezny is the current world record holder in the javelin. His record is over 323 feet. It takes tremendise upper and lower body strength to generate the power needed to throw the javelin such great distances. 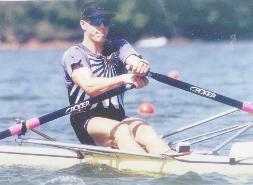 Jan has been the dominate force in javelin for many years. The shot puter is a very powerful athlete. It takes power the throw a 16LBS steel ball over 19meters. John Godina is one of the best at the shot put. He can get over 20 meters on a consistant basis. Rob Wadell might seem a odd selection. However it takes a lot of leg and back strength to propell a boat to a speed of 11.28mph by yourself. At 6'6 and 240lbs he is a big man and is very broad shouldered and thick bodied. Jason Tunks throwing the discus. The discus is a very old sport, going back to the time of the Greek empire. 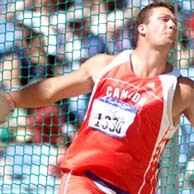 The discus athletes are very strong, Jason Tunks for instense can squat and deadlit over 500lbs. As you can see strength is involved in many different sports. When talking about srength not many people think about rugby, or discus, or some others, but they need to be strong just like a strongman or olympic lifter.